Kyle Egan Richards is an American actress, socialite, television personality, memoirist and philanthropist. She has starred on The Real Housewives Of Beverly Hills for eight years and will be returning for yet another season of drama. So of course, Kyle Richards knows how to make an entrance. 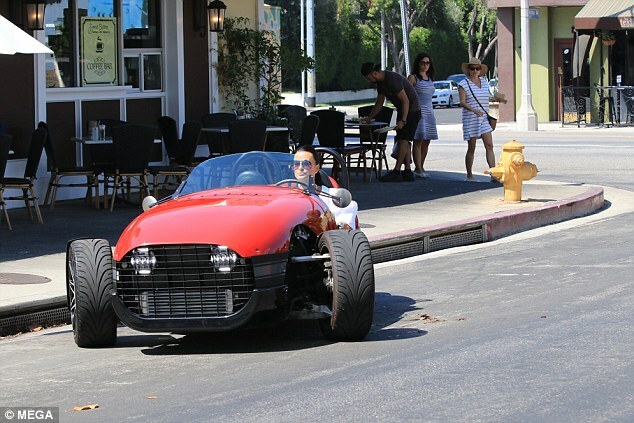 The 49-year-old arrived to film a scene of RHOBH with Lisa Rinna in an unmissable, hot red Vanderhall car on Wednesday. The star was ready to turn heads as she arrived at the cafe in her sporty, three wheel car. Kyle smiled wide as she stepped outside of the car, clad in a flowing white blouse and skinny jeans. The reality star had her jet black locks scraped back into a sleek and stylish ponytail, putting her beautiful complexion on full show.